White roof coatings provide two excellent benefits for a newly constructed roof. The first is reduced heat load to the building if it does not already have a reflective roof and the second benefit is that white roof coatings extend the roof’s lifespan. White roof coatings are reflective; allowing the roof surface to reflect a majority of the sun’s heat caused by ultra violet (UV) radiation away from the rooftop, back into the atmosphere. The ability to reflect the bulk of the radiation allows only a minimal amount of the remaining heat to be transferred into the building below. Most white roof coatings are able to reflect 80% or more of the sun’s heat compared to a black surfaced roof that absorbs the full amount of heat. Reflective coatings therefore provide a much cooler indoor climate without any air conditioning usage, while a black surface roof would heat the inside of the building at a faster rate, requiring the use of an air conditioning unit to provide a comfortable environment to tenants, employees and customers inside. The reduced heat load to the inside of the building offers energy cooling savings and reduced HVAC usage. This can drastically reduce your energy utility bill, resulting in substantial savings throughout the year. Reflective roof coatings contain UV blocking ingredients that protect the surface of the roof from premature degradation. UV rays are the leading cause of roof damage as a result of excessive heating of the substrate caused by prolonged sun exposure, ultimately leading to a brittle and inflexible surface, eventually leading to water damage and other forms of roof degradation. 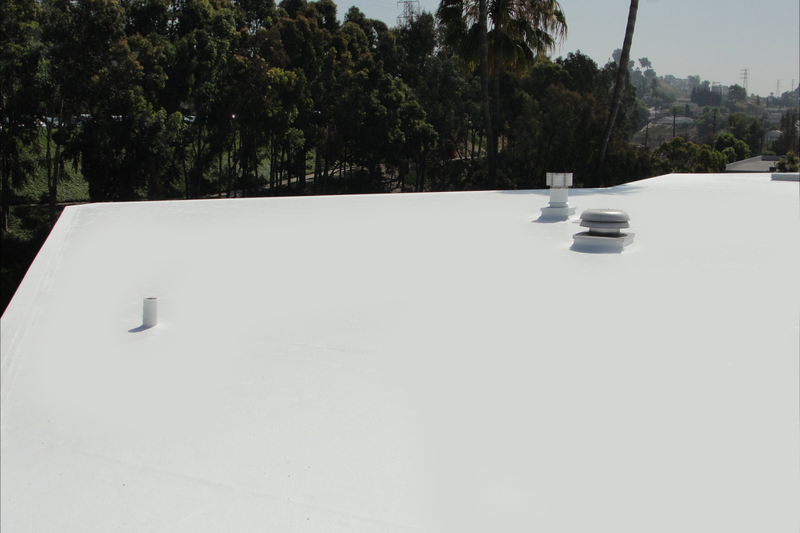 White roof coatings protect the roof with its ability to reflect the damaging UV rays, allowing the lifespan of the roof to be extended beyond the roofs original life expectancy. This concept can be compared to sunblock on our skin. Sunblock protects our skin from premature aging and sun damage, while the lack of sunblock creates premature damage - wrinkles, sunburns, blisters and more. 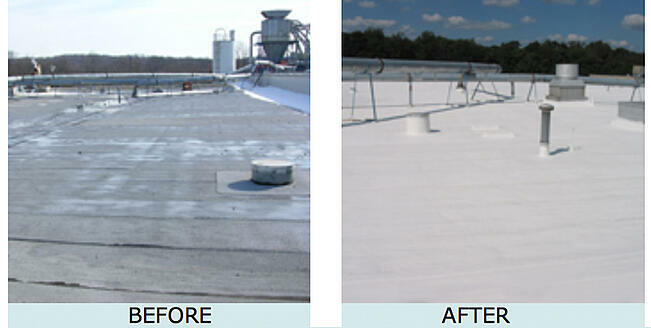 National Coatings strongly suggests the use of white roof coatings to protect your roof and lengthen its service life while reducing energy cooling costs. For more information on roof coatings, download our FREE guide – Considering Coatings, a Free Guide to Roof Coatings.